This entry was posted in Gun Rights, Quote of the Day, They want you dead, This is what they think of you by Joe. Bookmark the permalink. No. The person trolling under @SimonSaysBooHoo does (and may not even mean it). Generalizing about all progressives based on the random extremist (or just plain troll) is intellectually lazy. Please don’t be lazy. We yahoos are a (and I quote) “Basket of Deplorables”, who are “gumming up the works”. That’s Hillary Clinton and Barack Obama saying it– The random extremists, who happen to be at the very top of the Progressive movement, which is also a Eugenicist movement which you would know if you looked just a little bit of searching. They’ve also referred to the U.S. constitution as a “Charter of Negative Rights”, meaning that it’s blocking their way, it restricts government, and that it should therefore be turned around. Add that to their fifty year old, and growing, indictment against humanity for destroying the planet, and you have not merely an emerging picture, but a clear and inescapable conclusion; they want billions of people dead. They’ve been saying as much, outright, for decades now. We can very much generalize, because that’s part of the Progressive play book. It’s the general plan. But please, don’t listen to me; I would be very disappointed in you if you took my word for it. For one thing It’ll have a much greater impact once you’ve discovered it for yourself. The only reason to disarm a population is you want them dead. The fact that they want us disarmed therefore proves the point well enough, but there’s oh, so much more that you will discover once you’ve decided you care enough to look. Please don’t be lazy. Again, lots of generalizations. “The Progressive movement” Which one, exactly? Do you believe there is a single, unified “movement” to which all progressives belong? Is it that simple? “They want billions of people dead” Again, who is this “they” we’re talking about? I know lots of progressives who don’t want anybody dead. So clearly I’m talking to the wrong folks. Part of the reason I find this sort of discussion so problematic is my own experience: I’m neither progressive nor conservative. In the modern parlance, “It’s complicated.” On guns, I’m apparently “conservative.” On social policy, I’m apparently “mostly but not entirely liberal.” On foreign policy I’m somewhere in between. These neat buckets you’re identifying don’t, in my experience, exist. Perhaps my experience is unique. No one can generalize about Muslims, that is established fact, and no one can generalize about those crossing into our borders illegally, and so on ad infinitum, but by all means we must totally generalize about gun owners and NRA members– THOSE people are all crazy generalizers! Yes, Dear, I’m well aware of how this works. Now let’s have a conversation in which we don’t start out with insults, shall we? “All Progressives” means all those who adhere to or support the Progressive Movement. “Generally” they would be Progressives. Can we agree on that statement? So yes, I believe we can generalize and say unequivocally that Progressives all tend to be Progressives. Now let’s dig into exactly what it means to be a Progressive, in their own words, please. You can look into what Margaret Sanger (Progressive darling to this very day) wrote, and also Woordow Wilson at the time he was at Princeton. It those two you will have a good glimpse into the foundations of Progressivism. You probably won’t like what you find, especially of you’ve had any sympathies for the Progressive movement. If you can stomach that, then you can look up Fabian Socialism, but always be careful to go to the original sources whenever possible. Those you will find are the most horrifying. Modern commentaries are trying to whitewash it. And so again; to “generalize” a movement based on both its founders and it’s modern leaders is not only permissible, but required, if one is to understand trends. Your first paragraph is a straw man. I said nothing of the sort wrt generalizing about gun owners (I’m one, just in case you think you’re arguing with a hippie. I originally met Joe back in the 90s shooting plates at WSI in Bellevue.). And you seem to be complaining that liberals get to generalize but you don’t, and imply that you’d like to be able to generalize more freely. Is that correct? Wrt your third paragraph, that’s a tautology. Your fourth is cherry picking authors you don’t like and extrapolating them to represent all liberals. There are other equally prominent authors within the liberal tradition that contradict what your authors espouse, so again, I’m not seeing this unified “they” to which we can generalize. Turn in all of your firearms. If your family members own guns, make sure they all follow your lead. Apparently, we have been wrong all this time about how Americans took their liberty from the grasp of the old feudal order. There is nobody in this country that would disarm us and then murder those that are deplorable. The Nazis and the Russian Communist regimes that first disarmed their populations before murdering millions of them only wanted to have a reasonable discourse about privately owned firearms. We need to surrender all those pesky human rights to prove that 1984 and Animal Farm are indeed how-to manuals. But you first, John. You first. What is with all the straw men around here? I’m pretty sure …yep, I definitely haven’t asserted that we should get rid of guns, human rights, or surplus Peeps. I like debating, but only if you’re gonna debate points I actually make…. John I would agree with you if we weren’t currently inundated with people shouting the same message every day. This doesn’t look to me like just another Westboro Baptist Church with a half dozen assholes making stupidshit statements in public. The belief that all gun owners or NRA members are complicit with infanticide, and should be exterminated, is now mainstream. Yes, if you avoid Facebook you see less of this. So? Facebook is the predominant social network. What you see there reflects a major fraction of the noisy part of the popular opinion. But if you want non-Facebook opinions, we have those too. And who was that political candidate the other day who quoted the famous “from my cold dead hands” with a comment along the lines “sounds good to me” (applause from the audience). No, it doesn’t, it reflects what the FB algorithm thinks *you* want to see, nothing more. The correlation between FB posts within a given person’s feed and anything like “reality” is non-existent. Well I’m not on facebook so how embarrassing for you. Walmart’s hiring! No REALLY!! You WILL FEEL BETTER about yourself….ANNDDD….THEY PAY MORE!!!!! I mean IT IS about “feelings” and MONEY…RIGHT? Okay guys, dial back the personal insults just a notch or two. Try to retain a connection to the facts and reasonable extrapolation from the facts. We left the land of facts several posts ago, where I was magically transformed from a centrist libertarian to a hard left communist…. I know. I was hoping it would drift back without my intervention. Sorry, not seeing it. I agree there’s plenty of bias against gun owners within the popular media (modulo Fox news), but there’s a difference between what the media tries to sell (and wild generalizations sell well because they’re easy to digest) and what the majority of people believe. Wrt the “should be exterminated” assertion, I also see no evidence of that. Is there an actual poll, scientifically conducted, that shows a significant percentage of the population believe that? I haven’t seen it. I agree the media is worthless when it comes to guns and is heavily biased. But that’s not the same thing as what you’re asserting. One way to test the sentiment is to see whether the loudmouth teenage scum who spout it are corrected by their betters, or allowed to continue. For that matter, whether people who object to such sentiments are supported, or attacked for objecting to these nutcase teenagers. I suggest that (a) these crazies are not typically corrected, and (b) when someone does speak in opposition, as Laura Ingraham attempted to do the other day, she is attacked for daring to do so and her advertisers pressured to shut her down. Well John first you have to choose to see. This blog is a great place to start looking. I think Joe has some of your evidence currently pinned to the top of his blog, and I recall you posting on a number of other articles containing similar evidence. It would appear your choice is to remain blind, in which case I don’t think anyone can help you. “the loudmouth teenage scum who spout it” by whom you mean the students who lived through the Parklands shooting? “nutcase teenagers” “corrected by their betters”? Lots of ad hominem here, not much argument. The fact that they were at Parkland is no excuse for such insane statements. That’s not ad hominem, it is a reasonable assessment of the mental state of those who make such assertions. For us to believe your claim that this is a fringe position rather than mainstream we would have to see some significant pushback against the people making those statements. I’m not aware of any pushback. No, you’re the one making the assertion that one person saying that stuff is mainstream, the onus is on you to prove your assertion. Cite some evidence that this is what a large number of people specifically believe vs. the usual media froth. Being outrageous sells. It’s no surprise media outlets are giving the mic to people saying outrageous things. But that’s not the same as a commonly held belief among the general population. Wrt your belief that the measure of truth is whether anyone is pushing back: again, this is a media issue. The media doesn’t go out of its way to publicise moderate calm people saying moderate calm things. There may very well be lots of people criticizing those statements, but we’re unlikely to hear about them to the same degree as the original outrage because moderation doesn’t sell, and the media business is first and foremost about profit, not the clear and objective representation of reality. Put another way: you can’t complain about how the media slanders the gun community and doesn’t report reality, and then turn around and cite that same media to support your argument that liberals saying outrageous things represent truth. Clearly media people like to stir up controversy by giving the mike to people who say unusual things. The question is what they do right after. If the controversial statement is conservative, the speaker is attacked loudly. If the controversial statement is leftist, such as in this case, “crickets”. Yes, that is bias. My point is that “bias” is another word for “support”. The media dislike the positions they attack, while the like the positions they broadcast quietly. Now, it’s possible that this still reflects a fringe position, but in that case it’s a rather large fringe, consisting of the bulk of the mainstream media outlets. The most popular media outlet in the U.S. is Fox news. I wonder why NRA members aren’t being killed by the bushel. Maybe it’s because can defend themselves. Or maybe the whole “they want to kill you” thing isn’t true? Occam’s razor applies. You are obfuscating the subject at hand, and I think intentionally. 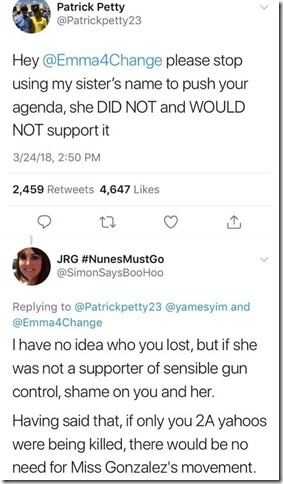 Now, if a person writes in a public forum that he thinks all Second Amendment supporters ought to be shot, it would be foolish to think his posting means that ALL progressives share the same sentiment, but it would be damned foolish to think that HE doesn’t mean it. Ooooh, careful with that one. That cuts both ways, and it cuts deep…. Don’t forget about presidents and would be presidents. Not to mention doddering ex Supreme Court justices. Guys and I’m talking to all decent, non SJW types here: you are being led by your benevolence and your rationality by a professional SJW troll who is making you dance through the well known hoops that should be reserved for decent people, not for leftist scum. By engaging him as if he was a normal human being instead of a collectivist cannibal SJW troll, you are wasting your time. Yes, they want you dead. Yes, they hate you passionately. They hate EVERY American value and its supporters. They are collectivist cannibals and their aim is the destruction of our civilization and they hope to feed on its remains and lord over the enslaved survivors. They are no different then any other cannibal in human history. [“generalizing is intellectually lazy”] Why do then SJW do it all the time? [“These neat buckets you’re identifying don’t, in my experience, exist. Perhaps my experience is unique.”] Your only “experience” if that of a collectivist SJW cannibal troll. [“That is a straw man.” “This is a tautology.” “That over there is cherry picking authors.” The other thing is what I say it is. And you are wrong because I say so.] It is all SJW BS. Is like having a conversation with an insane person. But these characters are not insane. They are cannibal SJW. The worst possible kind. [“the onus is on you to prove your assertion.”] This is the same kind of scum that denies the Holocaust and asks people to “prove” it happened. If you listen to a SJW cannibal troll you would think there are not SJW, no communists, no socialists, Fauxahontas is a real indian, Dolezal is black and Farrakhan loves Jews. You have to start recognizing a piece of cr@p when you find one. A SJW has in common with a turd the fact that there’s not a clean end to pick him up by. Once again, learn to recognize a stinking SJW when you meet one. They will say anything and do anything to get away with their will to destroy civilization and feast on and lord over the remains. There is not an iota of decency in them. You can forget that at your own peril. [Q] All the while they’re sniping at us, throwing urine bombs at us, making us miserable. They feign stupidity to make us try to prove stuff to them. Like a 2-year-old repeating “WHY!” And we’re too polite to call them on it, because we give them the benefit of the doubt. And now they’ve weaponized that too. When you’ve made your argument they just repeat the accusation. Totally disingenuous – and maddening. They don’t care. They’re just punishing you. Taunting you. Making you explain it again – waiting for any little slip up. They’re fighting, not debating. Punishing you for not being part of their clique – like a 6th grader. If they make you loose two irreplaceable hours of your life dealing with SJW scum, they are training you to avoid the fight the next time. They are degrading your ability. They are making you spend your ammo on a worthless target and tiring you up so they’ll defeat you with ease at the next encounter, tired and short on ammo. Learn to identify your enemy. A collectivist cannibal SJW troll doesn’t deserve to argue with a decent person. Kudos George. Superb explanation of the Psychotic left. Having a conversation with people like John is like having a conversation with a 2 year old but less fulfilling. Please stop it folks. Also, people like John and other Regressives is the reason I have more “supplies” buried now than I ever did! Molon Labe b!tc#e$. Joe have you considered further narrowing your meta tags to flag posts specifically threatening or calling for the deaths of gun owners? It may be useful for data mining in the future. If NRA Members and law abiding gun owners were a problem, there would be no anti-gunners. Oh. Wait. There ARE anti-gunners because NRA Members and law abiding gun owners OBEY THE LAW. Criminals don’t and Leftists always call for violence again NRA Members and law abiding gun owners. So who IS the problem? Not sure why my comment from April 1 isn’t here. I’ve known John for as many decades as I’ve known Joe, both are bright honest people of integrity. So if the only way you can make a point is through ad hominem and emotion then I hope you’ll consider gardening or reading a book in a quiet room, please. Rather then shrilly making “my side”(tm) look bad. The first comment from you before this was December 16, 2017. I delete spam regularly but I think I would have noticed if it was from you. Thanks for checking, it was probably either IOS or my fat thumbs.